Release Day Blitz + Giveaway!!! Thanks for stopping by! 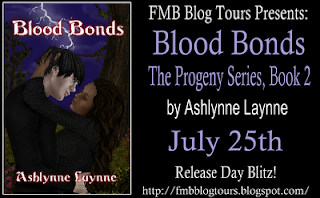 This tour was brought to you by: Full Moon Bites Blog Tours Don't forget to enter in the rafflecopter below for a chance to win an eBook copy of Blood Bonds (Book #2 in the Progeny Series) by Ashlynne Laynne. 5 copies are up for grabs!! When Ursula finds a new weapon—an ally with the capability to dismantle the Rousseau clan— Ascher and Shauna's bond is tested and they must stand together against Ursula or lose each other for eternity. Shauna wavered dizzily as her sister’s words resounded in her head. She’d endured his ridicule and constant put downs for most of her teenage life. She’d begged her mother to move in with her when she left, but she decided to go back with him. Shauna thought back to the day she left—the last time he’d ever lay a hand on her. Unable to control the rage, she shook violently. “Ascher!” Katy screamed, as she grabbed hold of her sister’s arm in an attempt to comfort her. The floor shook beneath their feet and the walls vibrated with her ire. The memories washed over her, bringing the fury and wiping her mind clear of everything else. The picture of Andreas Rousseau fell from the wall as the room continued to quake with her anger. A crystal vase of red roses flew across the room, shattering into glass powder. Shauna released an ear-piercing scream, as a crash of thunder boomed outside. “Shauna?” Katy gasped as she now cowered in the far corner of the room. Talking about their childhood really chafed Shauna. She knew that she’d have to bring closure to it for her sanity, but all she could think about when she thought of Gregory McCutchin was blood, destruction and fire. She wanted him to hurt as much as they did and to pay for what he’d done. Ascher yelled, “Shauna,” as he furiously attempted opening the locked door. “No, I’m afraid to move!” Katy replied. “Stay out of here,” Shauna ranted, her mind hurling the desk at the door. Shauna’s determined mind was insistent on keeping them out. She pointed towards the heavy wooded bureau, sending it flying across the room, wedging it on top of the desk and against the door. The bed levitated above the ground, hovering and twisting in the air before she made it zip out through the glass balcony doors. Dizzy and dazed, Shauna’s body slumped, falling to her knees. Closing her eyes, her head pounded with pain as Shauna furiously chanted, asking for guidance and strength to control her rage.